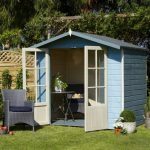 For those who have a small garden and want a smart looking and well made small summer house, the Althorpe Summerhouse is just ideal. This is a very classy looking summerhouse that has a real old school soul. This summerhouse has four large half glazed windows that have a smart arch framing to give them a little bit more personality. Two large double doors make getting in and out very easy and the doors have some very attractive classic looking fixtures to finish them off. 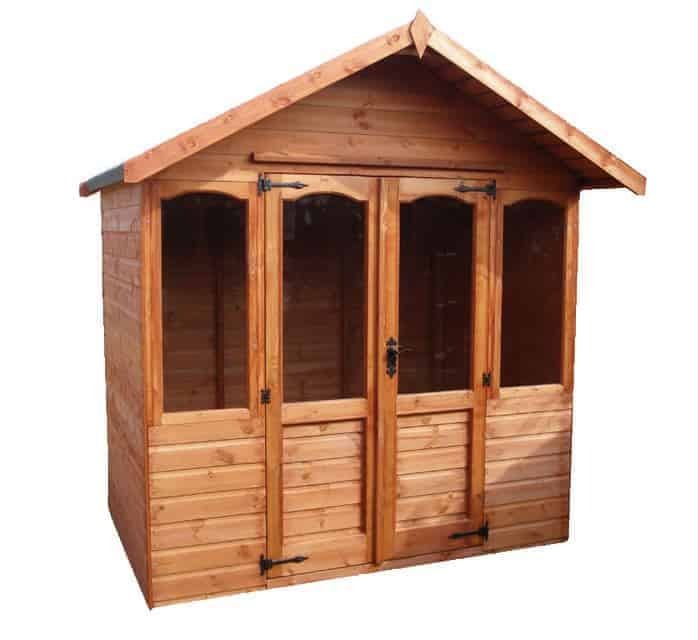 This summerhouse is a great size for smaller gardens. Its compact design will ensure that even smaller gardens will be able to enjoy this. This is a very well made structure and it is certainly one of the more robust smaller summer houses on the market. 12 mm thick tongue and groove cladding is what they have used for the walls this cladding looks amazing and will also ensure no rain gets inside. Working alongside the cladding is one very solid frame, which makes this summerhouse one very long lasting structure. Both the floor and the roof are made with tongue and groove boarding so they not only fit in with the style of the summerhouse, they are also very strong as well. Today we are looking at the charming Althorpe Summerhouse. This is a small summer house that is just perfect for gardens where space is something of an issue. It has a relatively small footprint so it really does not take up a whole lot of space. We really love the classic style of this summerhouse and feel that it has a timeless look. The width is 7 feet and the depth is 5 feet, so you are going to have to be a little bit crafty with how you lay things out inside of here. The height is actually quite surprising as along the ridge it is 7 feet 5 inches. The eaves height is also very impressive as it is just over 6 feet high so you will not have to hunch around while inside of here which is something we like. We really like the apex roof they have used and think the overhang is a very nice touch. The roof is made with tongue and groove boarding and then covered with roofing felt. We like how strong this roof is as it means it can take anything the elements can throw at it. Also the tongue and groove boarding they have used will look fantastic and make the inside feel more like a little home than just a shed you have put a couple of chairs in. 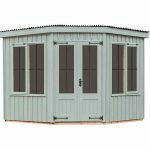 As standard the Althorpe Summerhouse comes with 12 mm thick tongue and groove shiplap cladding. We really like this kind of cladding as first of all it makes this one very robust small summer house. The cladding is going to be able to take a hit from a ball or kids running into it. Also the way it interlocks together means that there is no way rain can get inside. Plus it looks amazing. They have made sure the cladding has a very smooth look and that is something we really like. So that that you can use this summerhouse for a number of years, a strong frame has been used. Now they do offer framing upgrades, but at 34 mm x 44 mm we feel that the standard frame that comes with this is more than strong enough. 12 mm thick tongue and groove boarding is what will be under your feet. This is some very strong flooring that is going to be able to take a lot of weight. Also this kind of flooring feels a lot better under your feet than standard solid sheet boarding. The flooring also goes great with the cladding they have used for the walls and the roof so you have a very smart and uniform look inside the summerhouse. This is one very attractive small summer house and you will certainly want to keep it that way. Well to do this you will need to give the Althorpe Summerhouse a coating of wood treatment shortly after you have constructed it. Just one coat a year is all that is required to look after that gorgeous and smooth wood. 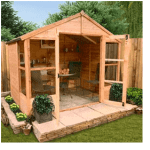 This is a very well made summerhouse so as long as you look after the wood, we do not see you having any problems, but you are covered during the first year with a manufacturer’s warranty which is there just in case there is an issue with one of the materials. The doors on this small summer house are fantastic. They have used large double doors which is very practical, but it is the design of these doors that has impressed us. These are very classically styled doors. They have used decorative hinges and an old school door handle to give the door a great personality. Also the windows are in this arch framing which just finishes the doors off nicely. There is also a door drip there to help prevent rain running down the front of the door. As well as the windows that are on the doors there is another two half glazed fixed windows on the Althorpe Summerhouse. These have the same kind of arch framing as the ones on the door and they look great. As there are so many windows on the front, you are going to get a lot of natural light inside here. Our only little criticism is that all of the windows are fixed. We really feel that one of them should have been an opening window. That fantastic looking door handle is not there just to look pretty. It also allows you to securely lock up the summerhouse when you are not using it. This because of the way it is made and the fact the door locks is actually one very secure summerhouse. There are a decent amount of windows on the Althorpe Summerhouse, but the fact they are all on the front means that depending on where you place this in your garden you can actually have a lot of privacy. Of course if you do want some privacy you can always just add a set of curtains or even some blinds. If you want to keep this small summer house looking great you have to treat it. They do actually offer different colours of wood treatment. They have Dark Brown, Red Cedar, Golden Brown, Light Brown, Clear, Rich Mahogany, Holy Green and Summertan. So before you go for the clear wood treatment have a think about using a coloured one to give the summerhouse a little bit more style. They have a number of upgrades for you to consider. Now before we tell you about these upgrades, we want to tell you that we feel the Althorpe Summerhouse is fine the way it is and none of these are really all that necessary, but they are there if you are interested. You can upgrade the wall cladding to 18 mm premier cladding for £157, or 15 mm loglap cladding for £157. The floor can also be upgraded. You can go for 18 mm thick heavy duty flooring for a cost of £69 which is actually a fair price. You can even add a large veranda. They have two veranda options with one being 2 feet 6 inches and costing £179, and a larger 4 foot veranda which is priced at £287. You are going to be able to enjoy this for a very long time. This is because they have used very solid materials and as long as you do give the cladding a bit of TLC, you are going to be able to relax in here for many, many years. 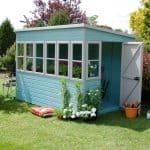 While ideal for smaller gardens, we must admit that this is one of the smallest summerhouses we have seen so you will have to be clever with how you organise things. You will need another person to help you with the installation, but the good news is this has been designed so that it is easy to install and you will only need basic tools to put it all together. So there is no need to hire a cement mixer, crane and apply for planning permission. This was a hard one to rate. 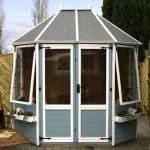 You see this is one very well made summerhouse and they have used the best materials they could, but the fact is, this is quite a high price for a summerhouse of this size. Final Thoughts: We love the design of the Althorpe Summerhouse. They have really done a great job in making a small summer house that is not only made with the best materials, it is also drop dead gorgeous as well. Honestly we have very few issues with this summerhouse as they have designed it so well. The only stumbling block is the price. Now the materials they have used are the reason the price is what it is, but the fact it’s this is a compact size summerhouse and we have seen ones twice the size for less money! 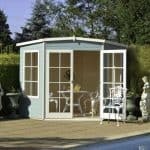 Still if you do not have a large garden, but want the best summerhouse possible, then this is one that you should have a serious look at.